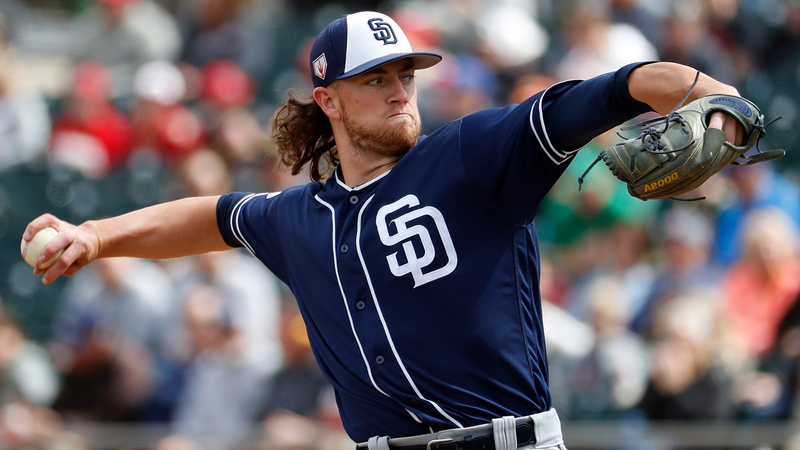 Chris Paddack might not open the 2019 season in the San Diego rotation, but he's giving his organization a lot to be excited about for whenever that day arrives. Baseball's No. 34 overall prospect racked up six strikeouts over four innings to take over the Spring Training lead as the Padres knocked off the Angels, 9-3. Paddack bookended the first and second innings with strikeouts before fanning one in the third and one in the fourth. The Padres' No. 5 prospect scattered five hits over four frames, allowing one run and not issuing a walk. The six whiffs gave Paddack 20 in 12 2/3 innings this spring, more than any other hurler in the Cactus or Grapefruit Leagues. Last year, the righty combined to post a 7-3 record and 2.10 ERA with 120 strikeouts over 90 innings between Class A Advanced and Double-A. Paddack's backstop continued pressing his case for a big league job to open the campaign. Francisco Mejia, baseball's No. 26 overall, went 2-for-3 with an RBI single to center field in the second and a leadoff double to right in the fifth. San Diego's No. 4 prospect is batting .414 with a 1.314 OPS this spring. Baseball's No. 20 overall prospect Keston Hiura continued flexing his power by belting a three-run homer off Trevor Bauer. The long ball was Hiura's third homer in his last four games. Get hot, stay hot. That's the way Bo Bichette is operating in his Spring Training showcase. Toronto's No. 2 prospect recorded two more hits, stole a base and scored a run in the Blue Jays' loss at Ed Smith Stadium. Bichette has eight hits in his last 17 at-bats with a .387/.424/.806 line overall this spring. The No. 11 overall prospect went hitless in his first two plate appearances of the day, then singled up the middle with one out in the fifth inning. Bichette moved into scoring position by swiping second base. The attempt drew an overthrow from Orioles catcher Jesus Sucre, and he advanced to third before Billy McKinney singled him home. In the seventh, the 21-year-old went the other way and sent a ball, which deflected off Baltimore second baseman Jack Reinheimer's glove, through the right side for his second hit. He grounded out to third in the ninth. Bichette has particularly stood out when given the opportunity to start. On the initial lineup card for the past three games, the 2016 second-round pick went 8-for-15 with four extra-base hits and four RBIs. Toronto's No. 3 prospect Danny Jansen singled while No. 10 Cavan Biggio walked and scored once. Ninth-ranked Sean Reid-Foley surrendered two earned runs on two hits and one walk over four innings out of the bullpen. Orioles No. 25 prospect Drew Jackson contributed an RBI single and 21st-ranked Cody Carroll picked up the save with a scoreless ninth.